The new Wright Performance 420 is the second collaboration between Performance Boat Center and Doug Wright Designs, after 2017’s game-changing 360 catamaran. With the Miami International Boat Show a month away, muscleboat builders are having to make some hard and fast decisions about which boats to display at the world’s most massive exhibition of marine wares. Undoubtedly, one of the most high-profile exhibitors will be Performance Boat Center of Osage Beach, MO, which plans to show off models by Sunsation, MTI and Wright Performance. Back at the PBC booth, PBC will feature one of its 360 Wright Performance boats: “It’ll be a customer’s boat that we borrowed, to show all of the latest and greatest features and upholstery and paint options,” Manire reports. In addition, they’ll be showing an Marine Technology Inc. (MTI) 42V center console with quad 400Rs, as well as a Sunsation 32CCX that sports an all-new dash and rear-seat configuration, powered by 350 Mercury outboards. In addition to getting boats ready for the Miami show, Manire and his crew will be flying to MTI’s manufacturing facility next week to check on the progress of their new canopied race boat that will be campaigned by John Tomlinson and Myrick Coil later this year on the offshore race circuit. 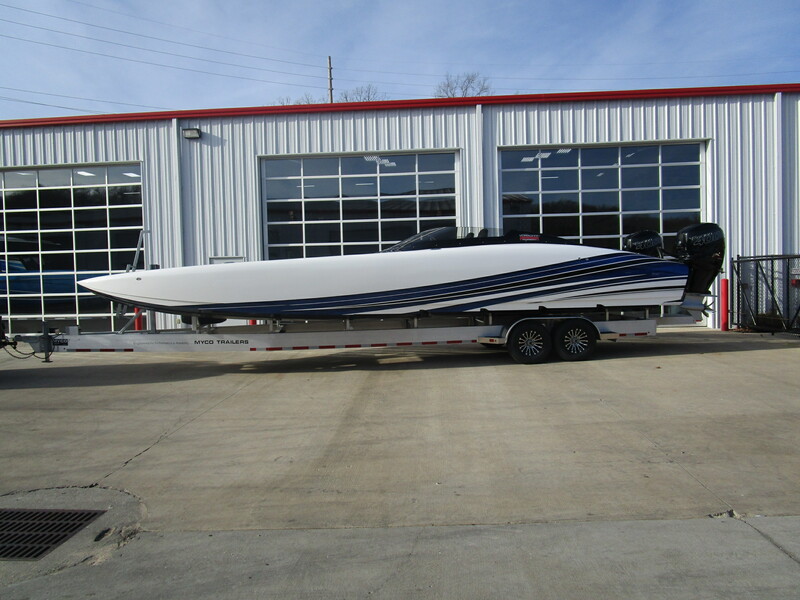 Meanwhile, PBC has been contracted by speedboat enthusiast Ron Szolack to retrofit its previous raceboat, the World Champion 388 Skater, with 2,200-hp PSI engines for its new owners.